This is a concept-project that I created, built on the campaign line “Lets Share." 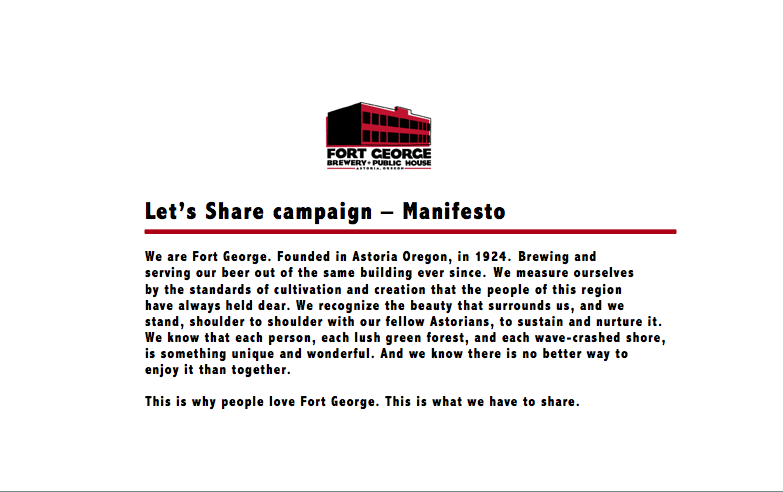 The campaign speaks to Fort George's efforts in celebrating regional talent, like the frequent events they host at the brewery. We would pull in social media to engage a younger audience and increase the campaigns overall impressions. This way we're preserving their intense sense of regional pride, while inviting others to be a part of it. The campaign could include beer cans, billboards, bumper stickers, and t-shirts with illustrations or photography by featured artists; 4 packs including a digital music download code or CD single; and beer cans with upcoming Fort George event schedules printed on them. Social Media could include a Facebook page and hashtag #FGLetsShare inviting fans to share photography, illustrations, music, pictures of themselves drinking Fort George at famous landmarks, etc. We would offer participants a chance to be the next featured artist, or to win an all-expense paid weekend in Astoria including a tour of the Fort George brewery.